The Borg & Overstrom mini water cooler is a perfect office water cooler CW628, which offers your visitors, staff and clients with fresh, filtered and high quality water. We at Water Cooler King understand the importance of providing safe water for your comfort and research the market to offer the best water cooler systems at great prices. This Borg & Overstrom Mini Water Cooler in Graphite is a compact water cooler and is a great unit to choose on where space is at a premium. With a height of just 50 CM this mini water cooler snuggly fits below most shelves or cupboards. 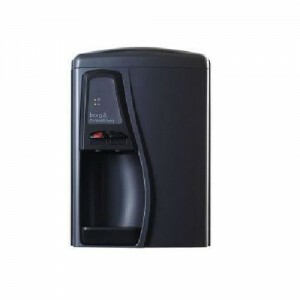 Famed as the perfect office water cooler the Borg & Overstrom mini water cooler is stylish and functional taking care of the water chilling and purifying needs. This smart water looks great in any office, reception area, show room or any location where creating a good appearance and use of space is important. This particular water cooler dispenses, water by push button operation which are thought to be more hygienic than taps since fingers are kept away from the actual water outlet. Cooling System : High Quality Compressor, no fan. Temperature held between 4 -11 degrees C via Thermostatic control.